This week saw a landmark hearing before the Supreme Court in Washington DC. Widow Esther Kiobel accuses the oil giant’s parent company, Royal Dutch Shell, of complicity in the murder and torture of Ken Saro-Wiwa and eight other Nigerian activists. 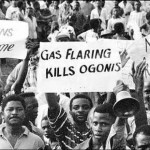 They were executed by the Nigerian military government after protesting Shell’s exploration and development in the Niger Delta in 1995. Essentially a case of relatives seeking to hold an oil company accountable for its deeds, it now centers on the question whether survivors of human rights violations in foreign countries can bring lawsuits against corporations in U.S. courts under a 1789 U.S. law called the Alien Tort Statute. See Twitter on #Kiobel for different takes on this hearing.